More than five years after the end of the Great Recession, and three years since the Occupy movement took on Wall Street, high and growing levels of income inequality continue to animate debates on politics and public policy. Inequality provided the economic backdrop for President Obama’s 2015 State of the Union address, the recent report of a transatlantic Commission on Inclusive Prosperity, and one of the most talked-about books of 2014, French economist Thomas Piketty’s Capital in the Twenty-First Century. Although each of those examples focuses on the actions that national governments should take to address inequality, continued gridlock in Washington has inspired growing interest and activity at the sub-national level around ameliorating inequality and promoting social mobility. In 2014 alone, 14 states and the District of Columbia enacted increases in their minimum wages. Many cities adopted or considered similar measures, most notably Seattle, which is raising its minimum wage to $15/hour by 2017. Some observers argue that cities themselves are better positioned to enhance social mobility for low-income residents than the federal government. This report updates a 2014 analysis that looked at levels of income inequality in the 50 largest U.S. cities, and examines in particular trends between 2012 and 2013, the most recent data available from the U.S. Census Bureau. Like the earlier analysis, it focuses on incomes among households near the top of the distribution—those earning more than 95 percent of all other households—and households closer to the bottom of the distribution—those earning more than only 20 percent of all other households. It then measures the gap between the two, or the “95/20 ratio.” All dollar amounts are adjusted for inflation to 2013 levels. In 2013, big cities continued to exhibit greater income disparities between rich and poor households than the rest of the country (Figure 1). Across the 50 largest cities, households in the 95th percentile of income earned 11.6 times as much as households at the 20th percentile, a considerably wider margin than the national average ratio of 9.3. This difference reflects the fact that in big cities the rich have higher incomes, and the poor lower incomes, than their counterparts nationally. From 2012 to 2013, the inequality ratio widened in both cities and the nation overall, as incomes at the top grew somewhat faster than incomes at the bottom. Notably, incomes grew faster for both the rich and poor in cities than they did elsewhere. 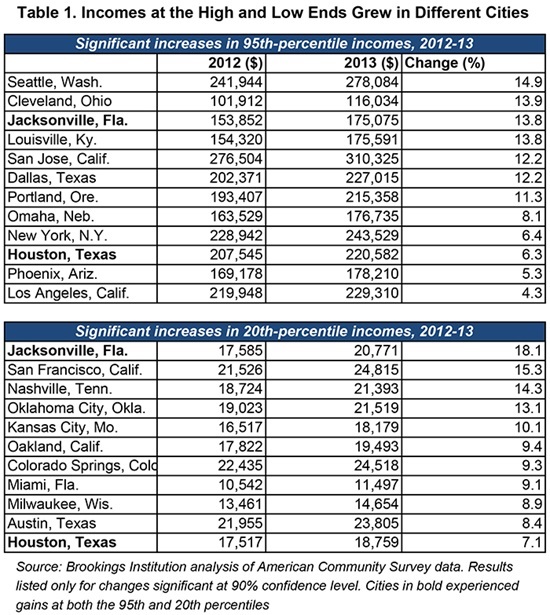 Several cities witnessed dramatic growth in the incomes of their highest-earning households between 2012 and 2013 (Table 1). In 12 cities, incomes for the 95th percentile of households in 2013 exceeded those in 2012 by a statistically significant margin. Seattle topped the list with 15 percent growth in income among those households, equivalent to a $36,000 increase. The three cities with the next-largest increases at the 95th percentile—Cleveland, Jacksonville, Fla., and Louisville, Ky.—are not generally regarded as wealthy cities, and indeed the 14 percent increases they registered near the top translated to lower increases in absolute dollar terms ($21,000 in Jacksonville and Louisville; $14,000 in Cleveland). Incomes for wealthy households also jumped by double-digit rates in San Jose, Calif., Dallas, and Portland, Ore. In only one of the 50 largest cities—Albuquerque, N.M.—did 95th-percentile incomes decline from 2012 to 2013. The Albuquerque region has struggled economically in recent years, and weak growth there seems to have affected households near the top. While not statistically significant, the estimated rate of income growth for rich households in San Francisco topped 18 percent, equivalent to a $66,000 bump. The Census Bureau does not provide enough data on high-income earners in San Francisco to conclusively demonstrate that increase, but the trend is consistent with anecdotal evidence on growing concentrations of very-high-paying jobs and households in that city. 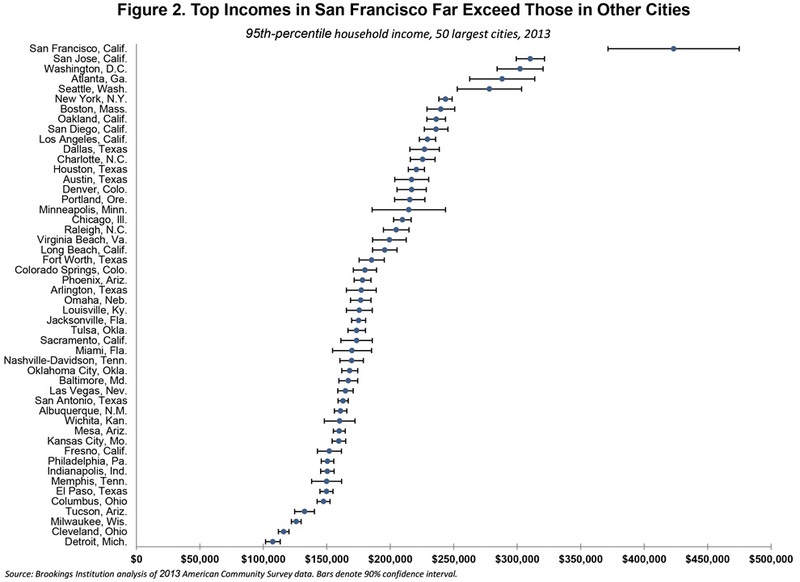 San Francisco also stands apart from the pack in just how rich its richest households were in 2013 (Figure 2). They earned at least $423,000, more than $100,000 clear of their counterparts in San Jose. Wealthy households in Washington, D.C. were the only other group whose incomes topped $300,000 in 2013. 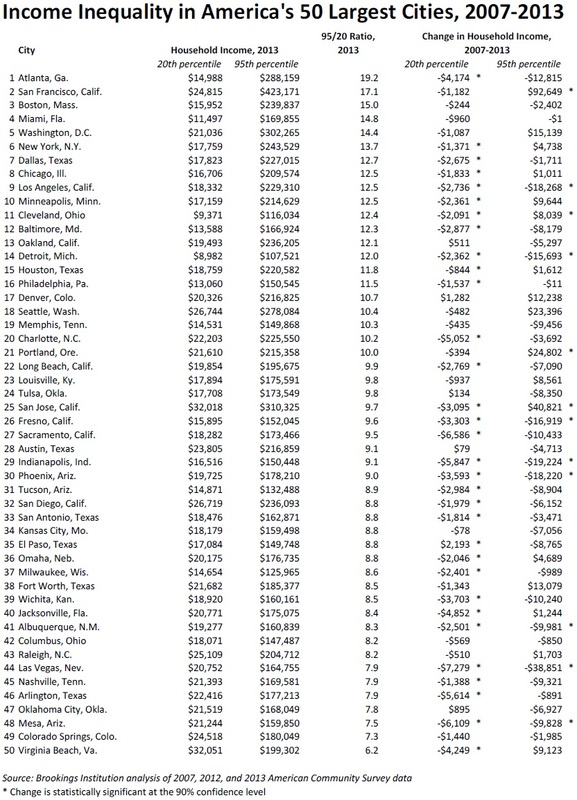 These cities contrasted sharply with Detroit, where incomes at the 95th percentile reached only $108,000. And despite a significant increase from 2012 to 2013, incomes among Cleveland’s top-earning households cleared just $116,000 in 2013. Click image below to enlarge. Click our return arrow to return to this article. This is a map of the most unequal cities in 2013 changed little from the previous year (Figure 3). Atlanta continued to lead the list, with top household incomes in that city nearly 20 times those near the bottom (Table 3). San Francisco still ranked second, with a 95/20 ratio of roughly 17. Boston moved up to third place at 15, while Miami dropped to fourth place thanks to modest income growth among its poorer households. Washington, D.C., New York, Chicago, and Los Angeles all remained in the top 10, while Dallas and Minneapolis moved in as Oakland and Baltimore moved out. Indeed, eight of the top 10 cities for inequality in 2013 also ranked in the top 10 in 2007. The cities with the most equal distribution of incomes also remained largely the same from 2012 to 2013. 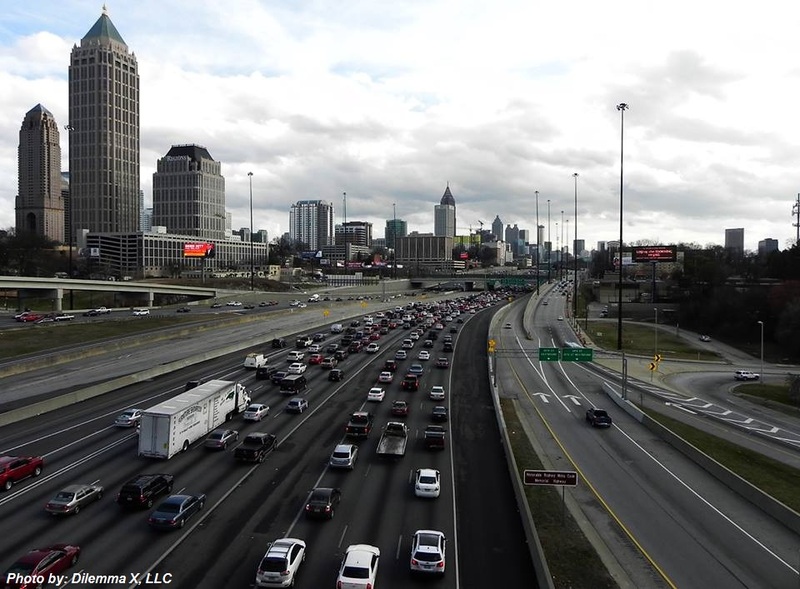 All are geographically large cities that incorporate large swaths of suburban territory within their borders, and most are in the South and West. In addition, these cities are not home to the concentrations of technology and financial/professional services industries that pay the very highest salaries and that characterize many of the cities at the top of the inequality rankings. 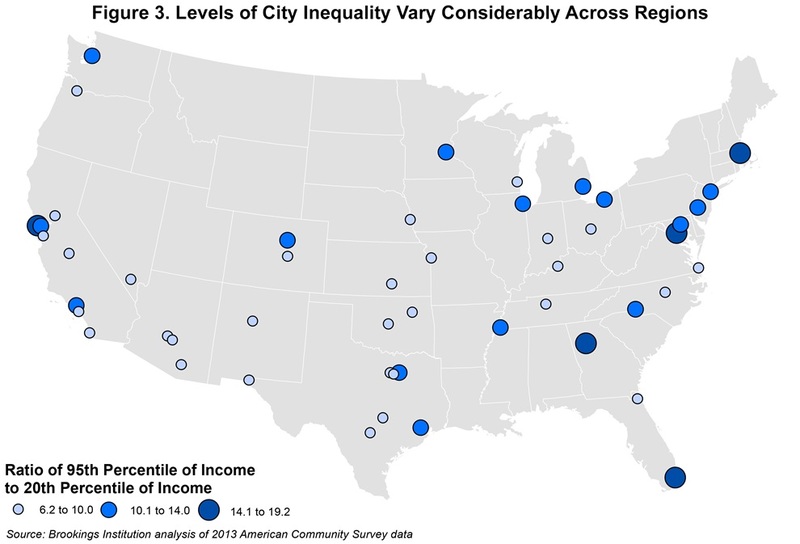 Trends through 2013 left many cities with higher levels of inequality than they exhibited in 2007, prior to the recession. 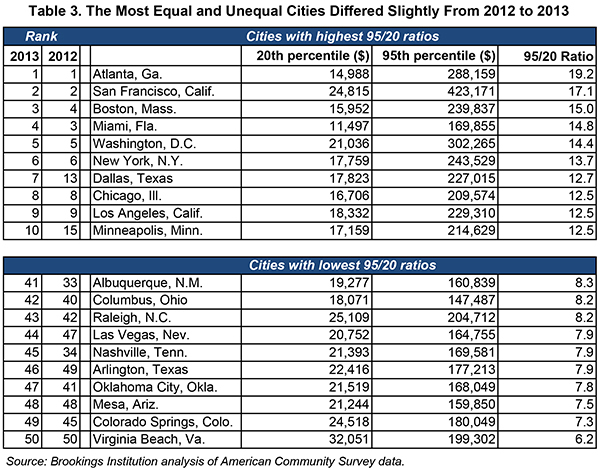 Twenty-one (21) of the 50 cities had a higher 95/20 income ratio in 2013 than in 2007. 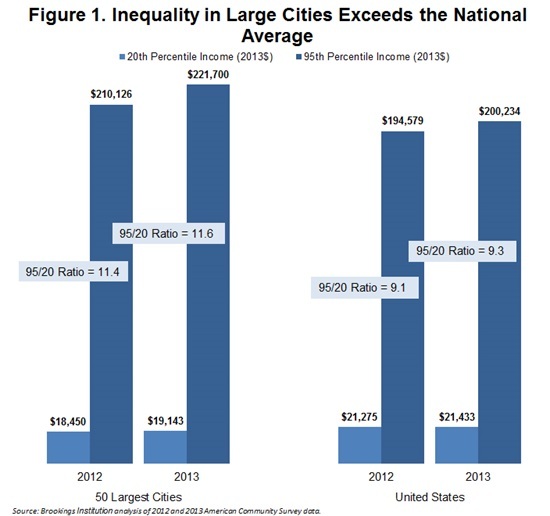 Atlanta and San Francisco, the cities with the highest inequality ratios in 2013, exhibited the largest increases in their ratios over that time. Interestingly, Cleveland’s increase followed closely behind, driven by the modest gains its top-earning households made in 2013, combined with losses its low-income households suffered in earlier years.